Can you explain some of the main differences between Hellboy and WQ Silver Tower. Both have some similarities - explore decks, ST unexplained rolls and Hellboys Deck of Doom etc. For those who aren't aware, Warhammer Quest: Silver Tower was a game I designed while at Games Workshop. I've spoken about its development loads, from White Dwarf interviews to written pieces to this very in-depth chat on the Fjordhammer podcast, but in short it was a reboot of one of the most classic dungeon-delving board games of all time (no pressure, obvs). I was responsible for designing the game (some incredibly talented other people managed the project, sculpted and painted the minis, designed the book, did the art, wrote the prose... I was just one cog in the machine!) and I was lucky enough to be able to do pretty much what I wanted with the rules themselves. The result is a game that definitely has its flaws, but of which I'm nonetheless very proud. When I came to design Hellboy, I definitely wasn't setting out to recreate Silver Tower, or even to create a spiritual successor. I'm a big believer in "theme first" game design - my first consideration is always "what's the theme, and what will be a good way to represent it on the table". (Some designers, like the famously prolific Reiner Knizia, prefer to come up with a game and only slap a theme on it when the design's complete - and there are countless other that fall somewhere between the two extremes.) As such, I started with a blank slate and began by thinking of the best way to tell a Hellboy story on the tabletop, never even *considering* Silver Tower. However, as Dave pointed out after reading the recent Hellboy Week posts, there are certainly some similarities! Of course, no one can deny the art style's different and original - did I mention that Mike Mignola drew the cover art for a game I'm designing? What's the next step above geeking out? Because that's what I'm doing. Hopefully, even when these similarities pop up in Hellboy, players will see that they're a lot more developed. I learned a lot during the development of Silver Tower and had a whole list of things I'd have done differently if I'd had the opportunity. Also, since the game came out, I've had the chance to see loads of feedback from gamers across the world about what works and what doesn't. Also, I've had a got more years of full-time design experience under my belt! In short, while the games might share common DNA in places, they're second cousins at best. I thought it would be fun to look at a few similarities and highlight the ways they're different. Here we go! For Silver Tower, I was really excited to get away from the "mission book with ten scenarios" that's always been a staple of miniatures-heavy board games (Space Hulk, Hero Quest, Mice & Mystics or Claustrophobia, to name a few). I did this with the Adventure Book, a booklet of mixed-up numbered passages reminiscent of a Choose Your Own Adventure / Fighting Fantasy book (or, more accurately, Tales of the Arabian Nights or Sherlock Holmes: Consulting Detective, both of which were big influences). This worked in tandem with the Exploration Deck - to expand the board you'd draw a card from the deck, which would tell you which board section to set up, and would often tell you to go to a particular passage in the Adventure Book. The idea was to keep the players engaged in the story; I wanted the thrill of a gamesmaster reacting to their actions and choices, and revealing snippets of narrative at key intervals throughout the game, while keeping things fully co-operative (i.e. without a player needing to be the gamesmaster). Sure enough, Hellboy does something similar with the Case File deck - when the Agents set out, they don't know what they're going to face. However, using a deck of cards rather than a book has several advantages, the most obvious of which is the ability to have cards "in play", ready to be triggered by certain events. In Silver Tower, the narrative sections of the Adventure book were only ever triggered by Exploration cards. In Hellboy, you'll have cards that say "flip this if all of the Agents are Knocked Out", "flip this if the agents find a particular point of interest", or "flip this card if Information Gathered reaches 8". This lets you have events directly triggering off the agents' actions, giving the players more agency and making it immediately clear to them what they need to do (or, in a lot of cases, what they need to avoid doing). Sometimes, Silver Tower felt like a rollercoaster - you were having fun, but you were never really in control. 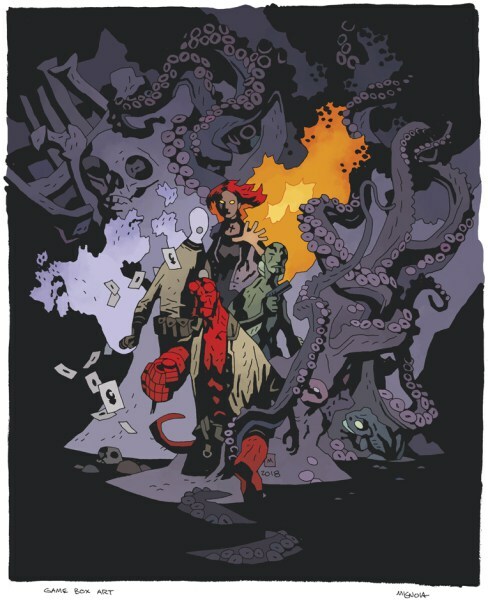 Hellboy couldn't be more different, with countless decisions to make and different ways to progress through a Case. While both games feature random events, Hellboy's a significant improvement in my mind. As Dave pointed out in his question, Random Encounters in ST are similar in function to the Deck of Doom; they introduce unexpected elements that are adjacent to the main narrative, but which tell stories of their own. One of the biggest criticisms I've heard of Silver Tower (apart from it being too easy) is that after a couple of games, you start seeing the same few events popping up time and again. There are 30 fixed Random Encounters, so this was inevitable in a single playthrough, let alone for players wanting to play through the game multiple times. I actually suggested - and started writing - an expanded Random Encounters table, which would have beefed it up to 72 different events, but nothing ever came of it. This is where the Deck of Doom is a real improvement. Just being a card deck means that cards can be introduced or removed as needed; for example, Case Files can include several themed Deck of Doom cards that make narrative sense or tie into the Confrontation, and there can be expansion sets which give enough cards for a whole new Deck of Doom. Also, with the Adventure Book I had a self-imposed rule: anything that happens needs to be instantaneous, because you can't expect players to keep the book open (especially when the rest of the page spread is filled with potential spoilers). Cards give a lot more freedom - an individual card can be put into play, lasting for a certain amount of time or until something happens. I find it interesting that both games have a way for the players to take a break from fighting and catch their breath. This wasn't intentional, but both games have the feeling of a roleplaying game, and in both cases I wanted to model the change of pace that happens between "combat" and "non-combat" sections of a pen-and-paper RPG. In Silver Tower this became Respite, where the players could elect to take a break in the Adversary phase if there were no Adversaries on the board, while in Hellboy it became the Rest Phase, where (again, if there are no enemies around) the agents can Take Time. This is probably the most similar mechanic between the two games; it provides an opportunity for Knocked Out players to recover (I hate player elimination in long games, so this is a no-brainer for me), then lets players either rest to regain some health or... do something else that's useful. However, Hellboy has something that Silver Tower doesn't, and it makes the decision to Take Time so much more tricky: the Impending Doom track. The very fact that a game of Hellboy is a race against time means that the game has urgency where Silver Tower lacks it. A Respite in ST meant you might draw the attention of enemies, generating a random encounter, but if your characters were beefed up sufficiently with treasure and skills this rarely felt like a real risk. In Hellboy you know you've only got a certain amount of time before the Confrontation begins, and Taking Time uses up a very real chunk of it. As a result I was confident in making the benefits even sweeter (it allows the agents to move wherever they like, for example), knowing that the more tempting I made it for the players the more chance they'd do it too often, potentially screwing themselves over in the process. Speaking of consequences, the damage systems for the two games aren't a million miles apart. Hellboy's system really feels like an evolved version of the one in Silver Tower. Of course, there's a big difference in that Silver Tower's damage system directly affects the actions you take. Normally you have four action dice, which you roll and place in spaces on your hero card. Damage fills in those spaces, meaning you get fewer action dice in your turn. If you take damage but all your spaces are filled, you're knocked out. Hellboy loses the dice element but keeps the spaces (in the health track). Damage is taken in the form of face-down damage counters, and when the track is full any additional damage flips those counters face-up, to show an Injury in the form of a skill icon (giving you an automatically downgraded die whenever you test that skill). If you take damage but all your spaces are filled with face-up damage counters, you're Knocked Out. This is immediately more nuanced; you have a certain amount of "free damage" that you can take before you suffer consequences, for a start. Also, Injuries only affect one test - if you've taken several Fighting and Shooting injuries, you can still Examine things as easily as ever. Also, as it's not tied to a static number (four action dice per player in ST), different characters can have a different number of boxes without impacting other mechanics. Overall, the system might *look* similar but in actual fact it's quite different, and a lot more involved. Silver Tower always had an edge of competition between the players (especially because Renown - the resource you use to level up characters - went to whoever finished off a bad guy, regardless of who did the bulk of the damage); this suited the narrative, with players taking on the roles of characters who didn't necessarily trust each other, but it was never really my intention. Of course, this wouldn't make sense in Hellboy. The agents of the BPRD are, for the most part, all playing on the same team; there might be a few minor rivalries, but they're rarely the focus of a story. No, on the whole, the agents need to feel like a cohesive team. One of the ways Hellboy achieves this is through assists, where a player can sacrifice one of their Actions to give another player's chances a boost. As you win (or lose) as a group, with no individual scorekeeping or leveling up, this happens a surprisingly large amount of the time! On the subject of leveling up, Silver Tower saw the heroes gaining new skills as the game progressed, carrying a number of them on to the next session. This didn't feel right for Hellboy; again, I'm a theme-first designer, and I can't think of many times in the comics where a character picks up a new ability or learns a new skill. (Yeah, there are a few, which I won't go into for fear of spoilers, but they're the exception rather than the rule.) Also, whereas Silver Tower told one continuous tale, Hellboy's Cases might be separated by months or even years. As such, instead of leveling up, characters in Hellboy are pretty static - however, you get to requisition a custom set of equipment each time you play, meaning no two playthroughs are going to be the same. Dave's question raised the issue of difficulty, and with good reason. Silver Tower was just too easy! It wasn't designed to be a particularly challenging game, but even with that in mind the later missions were a bit of a doddle. The biggest challenge was that the Trials could be played in any order, so there had to be a system for making the game more challenging as the heroes leveled up. In hindsight the solution was pretty clumsy - a patch rather than a fix. It basically ramped up the chances of being ambushed by bad guys whenever you took a Respite, but after each character had a couple of skills this just became "you will always be ambushed". This was far from ideal. As previously discussed, Hellboy has the advantage here in that there's no leveling up. Players can tackle the Cases in any order, and come back to Cases more than once, as each game session is its own thing; there's no campaign mode apart from the things you unlock by opening new Case Files. So that means it's a hell of a lot easier to balance the game! Also, we've made the conscious decision to make the game challenging. After all, it's a fully co-operative experience; if you play well on your first go and beat it, you might be less inclined to want to play again! I'm also looking into the idea of adding in "difficulty modes" which let you switch up the game for more or less of a challenge. We'll see how that goes! So there you go. Although there are some similarities between the two games, they're incredibly different. That said, if you enjoyed Silver Tower, you're likely to find a lot of the stuff that you liked in Hellboy, with ideas developed further and benefiting from the additional years of experience I've managed to pick up! Hellboy: The Board Game hits Kickstarter on 25th April 2018. I really recommend you come along for the ride - we've got gameplay videos and downloadable rules planned, with plenty of interesting stuff happening throughout the campaign. Thanks for reading, and if you know someone who you think might be interested, please share this blog!